One piece of travel gear, one travel accessorie, rarely anyone talks about? Luggage straps or luggage belts. In fact, as a person who mostly travels with a carry on backpack, I don’t think about these too often either. But if you travel with a suitcase or several, if you have a lot of luggage, these small things can save your day. 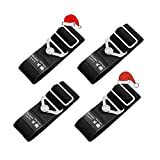 Using some of the best luggage straps not only your belongings will be more protected, but also identification of your luggage on the conveyer belt will not be a problem anymore. However, if you do want to make your bag even more easily identifiable, get yourself a cool luggage tag as well! Here, in this article, you’ll find 20 cool luggage tags. Here they are – 10 of the best luggage straps. Many of these luggage straps are available in different colors. Some of them come in sets while others are sold by the piece. 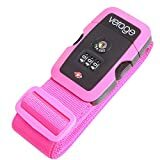 For more photos, latest price and user reviews check them out on Amazon – just click on the image of the luggage strap or click on that big orange button below it! By the way, if you are in a hurry and don’t want to check out the whole list – top 5 are our favorites. An adjustable luggage strap with built-in TSA approved 3-dial combination lock for extra safety. Made of nylon 900D material. Available in 3 colors, including pink, which will definitely make your bag much more easily identifiable. 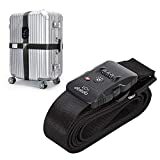 An adjustable cross luggage suitcase belt with built-in TSA approved 3-dial lock for added security. Straps are made of durable nylon. Features transparent ID card holder. Great fit for 18”- 32” suitcases (maximum length – 165” or 420 cm). Available in black, pink and rainbow color. A bright-colored adjustable heavy-duty luggage strap. Thanks to bright colors it makes your luggage much more easily identifiable among the rest. Belt length – 46”- 78” (1.2 – 2 m), width – 2” (5 cm). Great fit for 20”- 32” suitcases. Available in several bright colors. Same color and different color sets are available. Sold in sets of 2 and 4 and by the piece. A quality elasticated band luggage strap. Features non-slip silicone pad. Belt length – 45”- 80” (1.1 – 2 m), width – 2” (5 cm). Great fit for all the standard-sized suitcases (20’’- 32’’). Available in 15+ bright colors. Sold in sets and by the piece. An adjustable universal luggage strap. Features a transparent built-in ID holder. So there is no need for a separate luggage tag. Made for 16’’ – 32’’ suitcases. Available in 10+ colors. A fun-design, easy to spot heavy-duty luggage belt. Great choice for a family or group of people, as everyone can choose a different design. 20+ colorful luggage strap designs are available. A TSA approved secured luggage strap. Features a 3-dial lock for extra security and elastic, non-slip silicon pad. Standard-sized, long enough to fit 32” suitcases. Sold in sets of 2 and 3 and by the piece. 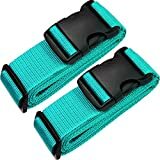 A set of 2 heavy-duty bright color luggage straps. Straps feature a built-in 3-digit password lock. Straps are standard-sized and long enough to fit even large 32” high suitcases. A very bright-colored suitcase belt to help you identify your luggage with ease. Availabe in several bright colors (pink, green, organge un blue). Straps are standard-sized and long enough to fit even large 28’’- 32” high suitcases. Sold in sets of 2 or 4 and by the piece. 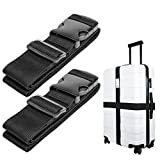 A set of 2 standard-sized luggage straps. Can be used to attach a second piece of luggage on the top of your large suitcase. Availabe in several colors. And here are some other, different style luggage straps. 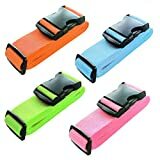 A simple yet useful travel accessory that comes in handy whenever you’re traveling with more than one piece of luggage. The Luxebell Add A Bag luggage straps does just that – it allows you to attach one piece of luggage to another, be it another smaller suitcase or let’s say a laptop bag. And… another add-a-bag luggage strap. Same like the one from Luxebell it allows you attach smaller piece of luggage to your wheeled suitcase. Sold by the piece and in 2-packs. Available only in black. A simple yet useful bag bungee solution to secure a second bag, jacket, coat or some other item to your suitcase. So you can move them as one. Available in dark blue.